Join us at The Slade Rooms for a celebration of 'The Last Big 50', a celebration of the 50th anniversary of when the greatest good-time rock'n'roll band became officially known as SLADE! SLADE UK deliver the sounds, the sights and the power of the UK's greatest live act... SLADE! 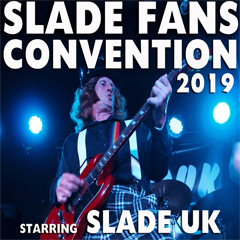 After the staggering success of the 2016 Convention at Wolverhampton's legendary Slade Rooms, they return by popular demand to re-raise the roof!